To all you alternative rock and punk rock fans out there: I want you to think back to your middle school and high school days. Music was a big deal. The type of music you listened to helped determine your social standing in school. Well, I’m sure all of you listened to Yellowcard, thus making you pretty cool. The punk-pop band is back with “Southern Air,” ladies and gentlemen, and they brought with them the familiar sound that we all know and love. Yellowcard released its eighth album 'Southern Air' August 14 with Hopeless Records. The album includes singles 'Always Summer' and 'Here I Am Alive.' The album stays true to the pop-punk band's original sound. The Los Angeles-based band formed in 1997 in Jacksonville, Fla., and released its first album “Midget Tossing” with DIY Records, followed by “Where We Stand” in 1999 and “One For the Kids” in 2001. The album that sparked a flame in the music industry was “Ocean Avenue,” released in 2003. This album presented the world with musical acts of genius that Yellowcard is best known for, including “Ocean Avenue,” “Only One” and “Way Away.” Next came “Lights and Sounds” in 2006 and “Paper Walls” in 2007. To the dismay of Yellowcard fans, the band went on a four-year hiatus but came back strong with “When You’re Through Thinking, Say Yes” in 2011. Yellowcard seems to go through band members like Miley Cyrus goes through hairstyles. 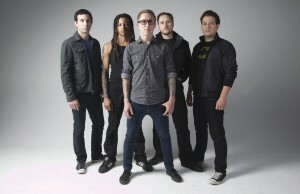 The band’s current members consist of Ryan Key (lead vocals, guitar), Sean Mackin (violin and vocals), Longineu “LP” Parsons (drums), Ryan Mendez (guitar) and Josh Portman (bass). What makes Yellowcard unique from its fellow punk-rockers is the band’s frequent use of the violin, which has become its signature sound. One wouldn’t think that a violin would mesh with the punk sound, but Yellowcard perfects it. The moment I heard the beautiful, harmonic violin shine through the heavy guitar and drums, I felt a sense of familiarity to the point where I couldn’t suppress my pride as a Yellowcard fan. Yellowcard would not be Yellowcard without that violin. “Southern Air,” which was released Aug. 14 with Hopeless Records, hooks listeners in on an impressive note with “Awakening,” an optimistic toast to the future and new beginnings. Key sings of living in the moment with his love, for tomorrow, reality will kick in and life will begin. “Bottoms up tonight, I drink to you and I. ‘Cause with the morning comes the rest of my life. And with this empty glass, I will break the past, ‘cause with the morning I can open my eyes.” Yellowcard holds onto its classic punk-rock sound with fast-paced guitar and drumming, accompanied by a haunting violin. Another prominent track is “Surface of the Sun,” which is clearly an anthem of youth. If there ever was a song of empowerment, this one is it. Key sings, “This is a story of restless nights, of do or do not ‘cause there is no try. Across a decade we flew high and we fell low. And getting up when we were dragged down is all we’ve known.” And I can’t help but point out the Star Wars reference, another reason to adore this song. It’s quite appropriate that this album dropped during the summer because almost every summer depicts truly living and breathing in the fresh air. The album makes you think of summertime, a time of carefree living. The third track, “Always Summer,” encompasses the idea that although summer is over it will always be in our hearts. “I know I let you down, but I’m letting out, and I found a way that I can tell the truth, make it up to you. I left home, but there’s one thing I still know, it’s always summer in my heart and in my soul.” The song’s quality was topped off with a breathtaking violin solo that will give you guaranteed chills. Key sings of the past and the future throughout the album, notably in “Here I Am Alive,” where he sings to himself from the past, telling him that, yes, he’s been through tough times, but he has made it out alive. The track “Ten” is a heartbreaking, mellow ballad depicting a miscarriage and ruminations of what fatherhood would have been like. The album ends with the title track, which takes listeners back to Yellowcard’s roots. Yellowcard is now based in L.A. but makes a point never to forget where it started in Florida. If you’re looking for inspiration on a downer day, I highly recommend giving Yellowcard’s “Southern Air” a listen. It is an upbeat and catchy album that will have you letting loose and living life the way you’re supposed to — freely.